Tianeptine has strong antidepressant and anxiolytic properties with a relative lack of sedative, anticholinergic and cardiovascular adverse effects, making it particular suitable for use in elderly patients and in those following alcohol withdrawal as these patients are known to be more sensitive to the adverse effects of psychotropic drugs. 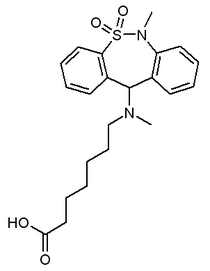 Currently, tianeptine is approved in France. The manufacturer there is Servier. It is also marketed to a host of countries in Europe, Asia and Latin America. Tianeptine shows efficacy against serious depressive episodes (major depression), comparable to amitriptyline, imipramine and fluoxetine, but with fewer side effects. It was even more effective than maprotiline in a group of patients with coexisting depression and anxiety. Tianeptine also displays significant anxiolytic properties and is useful in treating a spectrum of anxiety disorders including panic disorder, as evidenced by a study in which those administered 35% CO2 gas on paroxetine (Paxil) or tianeptine (Stablon) therapy showed equivalent panic-blocking effects. Tianeptine has been reported to be very effective for asthma starting in August of 1998, when Dr. Fuad Lechin and colleagues at the Central University of Venezuela Institute of Experimental Medicine in Caracas published the results of a 52-week randomized controlled trial of asthmatic children; the children in the groups that received tianeptine had a sharp decrease in clinical rating and increased lung function. Two years ealier, they had found a close, positive association between free serotonin in plasma and severity of asthma in symptomatic patients. As tianeptine was the only agent known to reduce both free serotonin in plasma and enhance uptake in platelets, they decided to use it to see if reducing free serotonin levels in plasma would help. By November of 2004, there had been two double-blind placebo-controlled crossover trials, and a 25,000+ patient open-lable study lasting over seven years, all showing effectiveness.